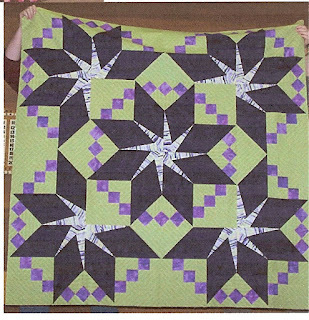 My Quiltsitters group is always coming up with unusual patterns that offer piecing challenges. One of those patterns called for piecing diamonds and nine patches together in such a way as to give the impression of forming a circle. Here's the lap-sized quilt I created. The diamonds were pieced of the dark purple and striped fabric. Can you see the nine patches? By placement of the light purple squares diagonally and then turning of them sufficiently you get the impression of circles. Isn't that "cool"? That is very cool! I also like the floating effect of the center star, it can either be foreground or background depending on how you look at it! What an interesting pattern, I love the star in the middle and I love the contrast in your fabrics, perfect.